Imagine a world where vast kingdoms are ruled not by men, but by beasts. Magic and mystery float through the air like clouds, and sword and shield protect the innocent. An endless world full of adventure and exploration. This is the background for a deck of cards known as the Decktet. The cards it contains mean many things and can tell the future as well as the past, wage wars and create peace, create sunny days at the market or deadly storms at sea. All things are possible through this one deck. Decktet is a game system, not a game in and of itself. This is important point to make before you read any further. Decktet provides the medium in which many, many different games can be played using the components of the system. Most of the time, when you buy a game, the game bits have been specifically tailored to compliment the game rules. Decktet takes the opposite approach and provides the bits but no game. At its core, the Decktet game system is comprised of a deck of cards. The Basic deck contains 36 cards in ten ranks. Ranked values go from Ace, 2 through 9, and a Crown. The ranks are further broken down into six suits. These are Moons, Suns, Waves, Leaves, Wyrms, and Knots. A single card will only have one number value (2 through 9), but might contain more than one suit. The Ace and Crown cards only have one specific suit (Ace of Waves and Crown of the Sea, for example). From there, the suits are further supported with the numbered cards. 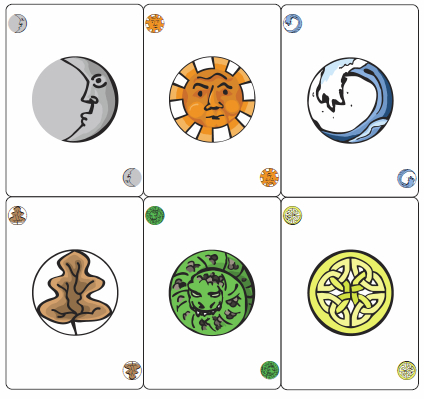 For example, the three number 2 cards represent the Moon/Knots, the Sun/Wyrm, and Waves/Leaves. The deck is further expanded with the Extended deck. This adds 4 Pawns (with 3 suits each), 4 Courts (with 3 suits each), and 1 Excuse. The Excuse card does not represent any rank or suit and is something like the Joker card in a standard card deck. 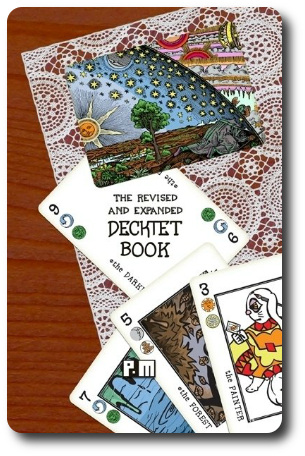 In total, the complete Decktet deck has 45 cards, but it also includes 9 Reference cards and a complete rule book that provides rules for two games, Nonesuch and Thricewise. 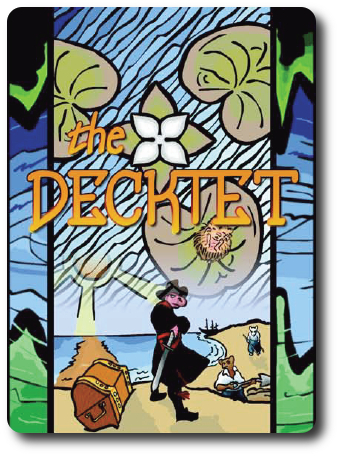 The Decktet card is meant to represent a number of things at once. Depending on the game, some aspects of the cards are ignored. 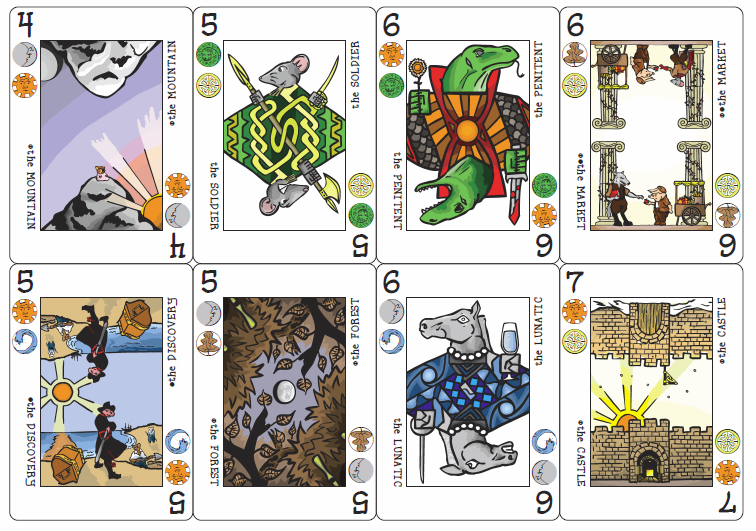 For example, all the cards are illustrated in a way that resemble the classic Tarot deck. 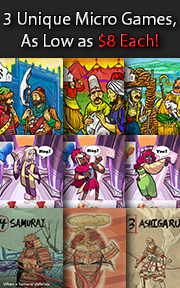 The cards themselves can represent personalities, events, and locations. There are small icons used on the cards to help identify what the card is and what it represents. Additionally, depending on how one views the card, the images are different. For example, the Crown Bard can be seen as an animal playing a lute, but if turned 180 degrees, is now an animal holding a sword. Depending on the game, this could mean something to the players, but again, the cards are meant to convey information which is only meaningful within the context of the game being played. If it doesn’t mean anything, it is simply ignored. Illustrations on the cards are colorful, whimsical (a word that has been overly used but describes the illustrations perfectly), and very stylized. All the images use animals to represent what would otherwise be people. Badgers, rhinos, birds, etc. There is something of a story on each card and one cannot help but have their eyes linger on each image as the details slowly emerge. All icons used on the cards are simple, big enough to quickly see, and placed on the edges of the cards making them easy to survey when in a player’s hand. The only other aspect of the Decktet deck that is worth mentioning is the three different types. These include the single, double, and travel type decks. The single deck is a complete extended deck (45 cards) and includes all the reference cards (this is the type we are reviewing). The double-deck is just two extended decks with the same card backing, but there is an additional icon on half of the deck to help make it easy to quickly separate into two decks. The travel deck is the 45 card extended deck, but the cards are half the size. Note sure why you would need something smaller than an already small deck of cards, but there you go. Additionally, Decktet decks come with slightly different card backing artwork and a few options for some of the stylized card front images. Regardless, all the Decktet decks are used in the same way. To play any game using the Decktet game system, you will need at minimum a Decktet deck of cards. Some of the games using the deck of cards call for markers, trackers, and chips. These can be anything the player likes, from peanuts to Poker chips. “What” they are is not important as long as they can be used to fulfill the game’s requirements. To address the needs of these games and to keep all the game components looking like they are from the same game system versus being comprised of bits and pieces of things in your house, the Decktet Suit chips were released and meant to be used as a Decktet game system supplement. The chips represent all 6 of the same suits in the card deck, match the suit images, and are of a color that not only compliments the suit icon but makes logical sense. For example, the Moon suit is on a black suit chip. Each suit has 6 chips, which means the entire Decktet Suit chips is comprised of 36 chips, but additional sets can be purchased and initial larger sets can include 60 and 126 chips. Also included are rules to the game Colour Bazarr, which uses the chips in the game to represent different colors and styles of fabric. The Decktet Wiki is a community based web site that is dedicated to creating games using the Decktet game system. Admittance is free and immediately gives the user access to over 60 fan created games that range from 1 to more players. The Decktet Book (revised and expanded version) contains a number of the games already listed on the web site, but only those that have been selected as the “best of the best”. The preface also suggests that each of the games is complete and fully tested. Also included is the brief history and structure of the cards, discussion on how to use the deck like Tarot cards, implementation of the cards in a role-playing game, further explanation of each of the suits, and a very detailed glossary full of charts and tables. There is even a map of the country in which the loosely themed deck is reportedly from. By itself, the book is a very interesting read and is written fairly well. It contains detailed rules, descriptive images, and examples on how to play the different games. As a supplemental game component, this piece of literature is most certainly invaluable for budding game designers and Decktet enthusiasts. The book breaks everything down in the game into smaller and easier to comprehend parts, which is a very good thing when attempting to make your own game. It is, in my many ways, an owners manual and also a guide book to the Decktet game system. To learn more about the Decktet game system, see the official web site and the wiki. The game license also allows you to print off your own copy of the deck if you prefer. A standard deck of cards is perhaps the first introduction to the gaming hobby that many of us experienced. Some of my earliest childhood memories are of sitting with my grandmother and playing Solitaire with her, learning the suits of the cards, and the numbers. Later, I would play War with my brothers and Crazy Eights. All of this from a single deck of cards. Much later in life, I would learn about specialty decks that were created to provide a base for games much in the same way as a standard deck of cards, but much more stylized. My first introduction to these types of cards was Pentology that proved to not only be an eye opener, but prompted a 3 month journey into game designing using the game system it provided. I learned two things from the experience. First, with a deck of cards that provides a system of rules that can be tailored to create unique games, anything was possible. Second, I was absolutely no good at designing games. I had no doubt that my little geeks, friends, and family would enjoy the Decktet game system and the games it provided, but I doubted the Gamer Geeks would enjoy it. Pentology, when we first reviewed it, suffered from not having enough games available to play and was more or less still dependent on the owner to create their own games. Not a bad thing, but close to impossible to get a good fix on the game system when there is little to play it with. This left a rather dissatisfied taste in the Gamer Geek’s mouth. I was told by the game designer, P.D. Magnus, that there were a number of games I should try right away that proved to be very popular with the Decktet community. I read through the ones that were suggested and picked a few to use that I thought were going to best exemplify the limits and range of the game system that also used the Decktet Suit chips. After that, it was only a matter of explaining the games and playing them. When I pitched one of the games to my little geeks, Jacynth, they were intrigued. I soon found out that they were more interested in playing with the cards than the game, and I had to wait a bit to get them back on track. Once they were ready to focus and learn, they were all ears. After explaining the game, they were ready to go with no questions. As I dealt the cards for our first game, I asked them their thoughts on the game system so far. It is unfair to judge a game system based off a single game that uses it. You really have to play a wide variety of games to fully understand how unique and flexible the Decktet game system is. After playing a number of games using the Decktet game system, I can fully understand the thriving community that is behind it. The games are fun, the cards work brilliantly, and everything just “worked” without issue. There were a few games built off the Decktet game system that I found to be fairly ho-hum and uninteresting, but these weren’t bad, just not fun for me to play. The Decktet game system worked so well with the games, I forgot the cards were universally generic. I knew the cards were not specific to the game we were playing, but it certainly felt like it. The Child Geeks enjoyed using the cards a great deal and the games we played. As promised, I turned over the deck to them to create their own games and they did not disappoint. Within an hour, they had created their own game using the cards, the chips, and (believe it or not) Star Wars characters. The game was super silly and in desperate need of balance, but the cards worked within the context of the game as if they were designed for it. Parent Geeks were most pleased with the Decktet game system and the games we played. One Parent Geek didn’t much care for the artwork and found some of it to be rather confusing When I dug in a bit further with her to determine the issue, I found out that she was making the assumption that a player needed to pay attention to all the artwork on the cards. I corrected her and made certain she understood that the cards were meant to represent lots of possibilities, but a game would only call for one or two. This helped her greatly and by her second game, she had nothing but praise for Decktet. Gamer Geeks surprised me and gave the Decktet game system an enthusiastic thumbs up, but I think this is based more on the games they played versus the game system itself. What they lacked with Pentology was made up for in volume with the Decktet game system community. They greatly enjoyed the wide variety of games that ranged from Euro-like resource management style to combat like games with area control and worker placement. They also commented that the large community that created games (and good ones at that) would ensure the Decktet game system was a “living thing” and would continue to provide entertainment and fun. 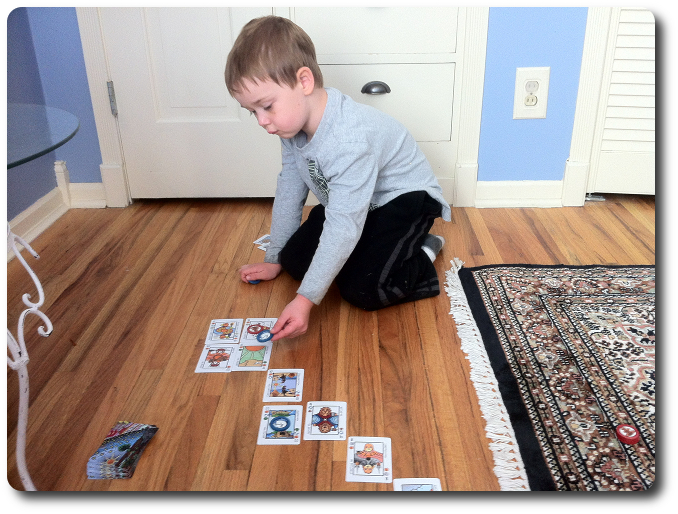 Playing Jacynth with my 5-year-old – he is surprisingly good at it! Gamer Geeks, this is a game system. Its value is difficult to measure unless you play a game using it. Based on that, the games that are provided and freely available are challenging, entertaining, and stimulating. Based on the sheer number of games available to you that can be used with the game system, your peer group unanimously agreed to endorse it, but with one small caveat. The game system itself does not provide any value other than potential. The Gamer Geeks wanted me to make this point very clear. Do not seek out this game system and think it will be a winner right from the start. Before you play a game, review all the games available, and play the one that sounds the most interesting. The game system is only the medium. Child Geeks, your peer group also fully endorsed this game system. My little geeks took the cards and chips from me and created games of their own. They used the illustrations on the cards to tell stories, found a great deal of inspiration from their use, and so can you. The games you can play are fun and challenging and the ability to create your own games kept your peer group spellbound. As a game system, Decktet is exceedingly well-organized, highly stylized without being unapproachable, and usable right from the start. Its system provides a near limitless number of games and the growing and thriving Decktet community keeps creating new games and new ways to play with it. I think it more accurate to refer to Decktet as a “living game system”. It is growing at this very moment and has no known limits. The game is what you make of it and the human imagination that uses it knows no bounds. If you are looking for a creative, artistic, stylized, and intelligently designed game system to play and create with, make room in your creative life for Decktet. 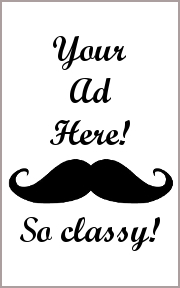 You will find it to be an invaluable tool and an endless source of enjoyment. Update: Emu Ranchers, a game created using the Decktet game system, has been reviewed and released for your eyeballs to feast upon. You’re welcome. Tagged Card Games, Father Geek Approved, Game Systems, Gamer Geek Approved, Parent Geek Approved, Print and Play Games. Bookmark the permalink. You say in the review that the decktet has worker placement and area control games. I have found the area control – jacynth, perhaps others – but would you mind sharing what worker placement games are available? I’d love to give it a try! Yes, try Kingpins. In this game, the players are given “Agents” that they use to “bid” on cards. The Agents grab and control cards that are used to create and complete “capers”. Players have a limited number of Agents which represent what time and resources are available to the player. Agents slowly come back to the owning player, which means the player must carefully consider how they use their Agents when going for cards. The player with the most Agent on a card “owns” it, but that also means the player has less Agents to work with. Do you spread yourself out and control a large number of cards or do you keep your Agents grouped and focused? More workers on a card means it WILL be done, but will take longer to pull off the Agents, as they are consumed with your orders. Or, if you went the path of as few Agents as possible, you’ll be able to get them back sooner, but you run the risk of losing control of the card. As soon as a card a player owns has all the Agents removed, the card can be used to score. This game has an interesting mix of area control, worker placement, and resource management all blended together. The area control aspect is the set of cards that need to be collected but are fought over with the bid, the worker placement is the Agents that are used to define where the players are sending their troops to control the cards, and the resource management portion is the Agents themselves as they will stay on a card that was won but only one Agent is pulled off each turn. Until all the Agents have been removed, the card remains owned, but unusable.